For two hours in December, USA is returning to it’s “blue skies” era of television when the era’s longtime staple Psych returns for Psych: The Movie. The film, which sees the entire main cast — including a cameo from Timothy Omundson, who suffered a stroke shortly before production on the TV movie began — is promising to be everything fans loved about the hit series and then some. Three years has passed since Shawn (James Roday) and Gus (Dulé Hill) left Santa Barbara for San Francisco. It was goodbye, but not for long because when we catch up with them again it’ll be like no time as passed, as the gang will be solving a brand new murder. But don’t be the 100th Luftballoon and go in cold, catch up with your favorite fake psychic detective before the big reunion. With just days to go until Psych: The Movie graces our TV screens, we’ve assembled a list of essential Psych episodes to catch you up on all the action without having to relive all 121 hours of the series…unless you want to. After a few casting shakeups in the first few episodes, Psych quickly found its footing in this goofy episode where Shawn and Gus are hired by the widow of a bank robber to find some missing stolen money. That is, they’ve got to find it before her husband’s accomplices, who were recently released from prison, and are also looking for the money. It marks the beginning of a pattern on the series of cases Shawn and Gus finagle their way into when explicitly not hired by the Santa Barbara Police Department. While Season 1 set up many of the show’s long-running gags and proved just how absurd the series was willing to go, Season 2 is when things really took off, as encapsulated by this hilarious parody of American Idol. Shawn and Gus go undercover on a musical singing competition after the life of its most famous (and hated) judges is threatened. The only issue is their act needs a lot of work. Guest star Tim Curry — the first of many famous faces to appear on the show — gives Simon Cowell and Grumpy Cat a run for their money as he’s subjected to keeping Shawn and Gus’ musical aspirations alive for the sake of his own well-being. Over the course of its run, Psych shied away from having too many recurring “Big Bads” — but when they did, they were always top notch. While every episode of the Mr. Yang trilogy is essential viewing, this Season 3 episode introduces viewers to the deranged serial killer who emerges from hiding after finding a formidable opponent in Shawn, is by far the most terrifying villain on the series. As with all Yang episodes, “An Evening with Mr. Yang” breaks the comedic formula of the series as it ups the stakes as one of Shawn’s loved ones is taken. Ally Sheedy is terrifying and mesmerizing as the oddly charming Mr. Yang and Jimmi Simpson is hilarious as the bizarre Yang expert Mary Lightly. In this episode, Gus is reunited with is a cappella group from college after one of them is killed and yes, Shawn is jealous. Despite falling out with the group, Gus and Shawn are hired to look into the death of the fallen baritone and things get hairy as the other members of the group become targets. Jaleel White and Kenan Thompson’s Tony and Joon prove to be even more disruptive than Shawn and Gus at a crime scene, and together they serve up some serious laughs. Plus Boyz II Men sing the theme song for the episode. That’s a win. A standard investigation revolving around an ice cream truck accident takes a turn when Shawn flies a little too close to the sun and wakes up in the trunk of a car with a gunshot wound to the shoulder. Gus, Lassiter, Juliet, and Henry must piece together what happened to Shawn before its too late. Meanwhile, Shawn is forced to rely on his father’s childhood lessons to evade his captors. As Shawn is separated from his family and friends, the episode allows the chemistry between the rest of the cast to shine as it brings together characters who generally don’t spend a lot of solo time together — like Juliet and Gus, or Lassiter and Henry — as they work to find Shawn. Plus, over a decade later, informing your best friend that you’ve been shot via casual text: “binshot not lol” is still hilarious. Sure, this episode was made thanks to the world’s obsession with The Hangover, but it remains one of the funniest Psych episodes in existence. Things get a little hairy at an SBPD officer’s retirement party as Shawn, Gus, Lassiter, and Woody wake up the next morning without any recollection of the night before. As the four piece together their wild night out, they must in turn solve the murder holding the key to their memories. Like Yang, Psych Pierre Despereaux was one of the most iconic recurring characters. While any episode featuring Cary Elwes’ dashing James Bond-esque art thief is worth a watch, Despereaux’s Season 6 appearance is certainly one of the more explosive. Shawn and Gus team up with their thieving frenemy after an art collection they were supposed to be guarding goes missing. But it turns out the stolen items are just the key to something even more valuable as Shawn and Gus try to determine whether Despereaux is actually helping them or is actually in on the job. For its 100th episode, Psych decided to go big, paying tribute to cult classic ’80s film, Clue — yes, the film based on the mystery board game. Shawn and Gus find themselves attending a mysterious dinner party in a gorgeous old mansion. But when the lights flicker and an attendee winds up dead, the episode turns into a classic whodunit — as everybody has a motive and nobody seems to be telling the truth. Shawn and Gus get a little in over their head after they become prime suspects in the murder of Gus’ boss. Gus has finally had enough of his pharmaceutical job and dramatically quits via note. But after a moment of clarity, Gus realizes that he needs the job to support both himself — and Shawn, of course — and returns to the office to find his boss murdered. Naturally he and Shawn accidentally tamper with the crime scene in a pretty big way and have to solve the case before the evidence left at the scene is traced back to the two of them, implicating Woody, Henry, and Jules in the process. 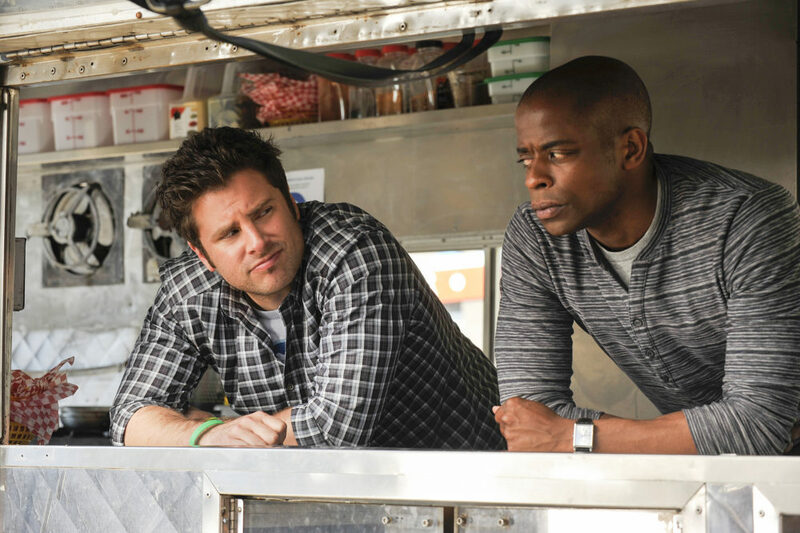 Shawn and Gus set out to investigate the murder of their favorite food truck driver by opening a food truck of their own. As they learn the complicated politics of the Santa Barbara food truck scene, they must also keep an eye out or Marlowe, the very pregnant wife of new Chief Lassiter. Meanwhile Henry is selling Shawn’s childhood house and the SBPD must move on without Chief Vick and Juliet, who are now in San Francisco. Just a few episodes away from the series finale, the episode is definitely setting us up for a bittersweet farewell, but it doesn’t skip out on the nonsense we’ve come to know and love from the series. We’ve heard it both ways, but Psych: The Movie airs on USA on December 7th.